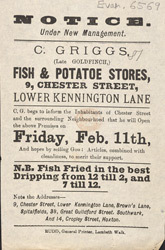 This is an advertisement for C. Griggs' fish and potatoe stores. We have gained much of our information about food in the Victorian period from cookery books published for the different classes. Vegetables were available although they were seasonal and so not available all year round. Vegetables like parsnips, turnips, carrots, potatoes and onions are frequently included in recipes. This grocer is not only selling vegetables but also fish ensuring that his business was successful all year aound.